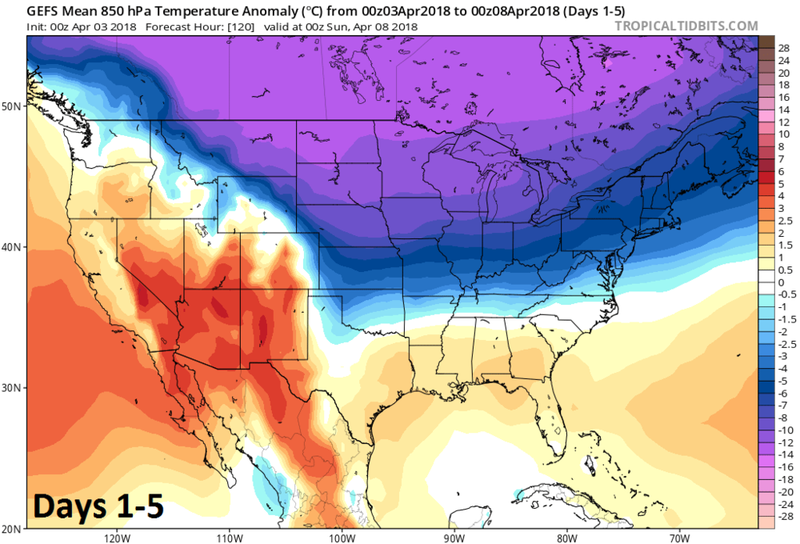 The overall weather pattern in the Mid-Atlantic region will remain colder-than-normal into at least the middle of April, but that doesn’t mean every single day will be below-normal. In fact, temperatures on Wednesday will jump into the 60’s in the DC-to-Philly-to-NYC corridor ahead of a cold front which could generate thunderstorms and strong wind gusts, but then much colder air returns for tomorrow night and Thursday. Another strong cold front will arrive on Friday and low pressure will likely form early in the weekend along this frontal boundary zone as it stalls out just south of here. This system could very well produce accumulating snow in the I-95 corridor on Saturday and that may not be the last threat of snow in this seemingly never-ending active and cold weather pattern. A warm front is pushing towards the region this afternoon and there will be occasional rain as a result from this afternoon into Wednesday. In addition, patchy fog can form in the overnight hours as temperatures likely slowly rise following the passage of the warm front. On Wednesday, a strong cold front will approach our region from the Ohio Valley. 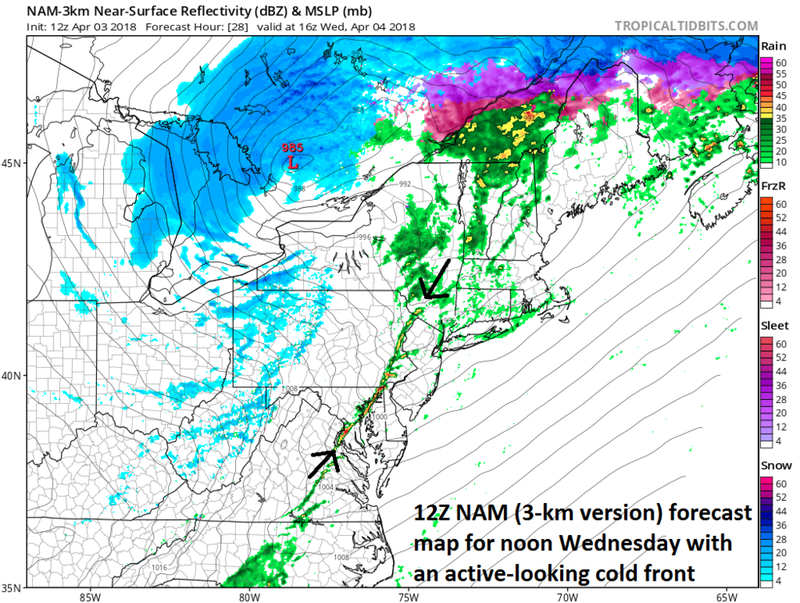 There is likely to be a widespread severe weather outbreak later today in the Ohio Valley - perhaps the most extensive of the season so far - associated with this strong cold frontal system. Temperatures will spike into the 60’s on Wednesday in the DC, Philly and NYC metro regions and there will be occasional showers and perhaps a few embedded strong thunderstorms. In fact, some of the thunderstorms on Wednesday can reach severe levels possibly producing damaging wind gusts of 50+mph as the front whips through during the mid-day hours and the rest of the day will feature very strong wind gusts as well with isolated power outages a threat. Temperatures may actually fall in the afternoon following the passage of the strong cold front and windy and cold conditions are coming here for tomorrow night and Thursday which happens to be Opening Day for both the Phillies in South Philly and the Nationals to play in Washington, D.C.
A "clipper-type" low pressure system will then trek across the Great Lakes region on Friday and push some rain shower activity into the Mid-Atlantic region with snow showers likely across interior sections of the Northeast US. A cold front will trail this clipper low pressure system and its passage will usher in much colder air for the weekend in the Mid-Atlantic region following a bit of a warm up on Friday. This frontal system will then stall out just to the south of here on Saturday and another low pressure system is likely to form along the frontal boundary zone and ride to the northeast. The northern extent of the storm track on Saturday is still in question with some computer forecast models (e.g., Euro) keeping the system confined in areas to the south and east of the DC-to-Philly-to-NYC corridor; however, there is reason to believe it will indeed push farther to the north and west. If so, cold air in place will feature way below normal temperatures for this time of year (~20 degrees below normal) and will likely support accumulating snow and this time the accumulating snow threat could actually extend as far south as the DC metro region and perhaps to other nearby areas in the southern Mid-Atlantic (e.g., central Virginia, southern Delmarva). More cold air outbreaks are likely to follow during the next seven to ten days and there may very well be additional snow threats in this on-going active and cold weather pattern - perhaps as soon as the early or middle part of next week.